2018 was an important year for most of the teams to build up their squads for the 2019 ICC World Cup. It was quite a stellar year for India and England in the 50-over format as they performed really well right throughout the year. India were the second most successful team in the 50-over format in 2018 after England. The Men in Blue won 14 out of 20 ODIs that they played in 2018 while two of them ended in tie. Under Virat Kohli’s captaincy, they won an ODI series in South Africa for the first time in their history. Under Rohit Sharma’s captaincy, India won the Asia Cup held in the UAE. Although it was a complete team performance as each and every player played his part in their consistent display, these three cricketers were the prominent reasons behind India’s impressive show in ODIs in 2018. Kuldeep Yadav is one of the very few chinaman bowlers at the moment. He was very consistent in 2018 and performed wherever he played. The left-arm spinner was at his very best against South Africa and England in their own backyard. He took 17 wickets from 6 matches in South Africa and 9 wickets from 3 matches in England. The chinaman bowler was India’s highest and overall second highest wicket taker in ODIs in 2018. From 19 ODIs, the 24-year old picked a total of 45 wickets at an excellent average of 17.77 with 6/25 being his best figures. He is currently at number 3 in ICC’s rankings for ODI bowlers. Kuldeep played a major role in India’s success in 2018. India will want their ace chinaman spinner to continue his form in 2019 as well. He will be one of the key players for the Men in Blue in the 2019 World Cup. One of the three batsmen to cross the 1000-run mark in 2018, Rohit Sharma was in great form in limited-overs cricket. He also led the Indian team in the Asia Cup in the absence of regular skipper Kohli. Rohit’s captaincy in the Asia Cup was quite impressive and India ended up winning the tournament. Captaincy took his game to a different level as he scored consistently throughout the Asia Cup and ended the tournament as the second highest run-scorer. He racked up 317 runs at an excellent average of 105.66 from five matches. 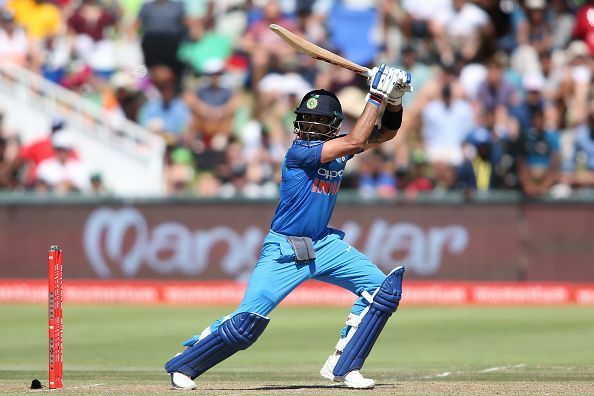 In 2018, the Indian vice-captain scored a total of 1030 runs from 19 ODIs at an unbelievable average of 73.57. His highest score of 162 came in the home series against West Indies. The elegant opener scored five centuries and three half centuries. Rohit hit the most number of sixes in 2018 as well. He was the second leading run-scorer in the 50-over format in 2018. The right-hander is currently at number 2 in ICC Rankings for batsmen in ODIs. There was no stopping Virat Kohli in ODIs in 2018 as he took his consistency to a whole new level. Despite missing the Asia Cup, he was the highest run-scorer for the Indian team in ODIs in 2018. It was a great year for Kohli. He slammed a total of 1202 runs at an astonishing average of 133.56 and excellent strike rate of 102.55 from just 14 ODIs. He scored six centuries and three half-centuries in 2018. An unbeaten 160 against South Africa at Cape Town was his highest score of the year. The Indian captain is currently the number 1 batsman in the ODI rankings. He ended the year as the leading run-scorer in the 50-over format. Undoubtedly, he was the best cricketer in 2018 across all formats.